Special Challenges is a video created by Professor Katie Steed in the Special Education Department at BYU. Watch the video below and then consider sharing it with someone! The Church News has provided an excellent review of this presentation available here. As part of the Men and Women of Faith series sponsored by the Church History Library Dr. Bryce Fifield will be giving a presentation titled The Untold Story of Mormon Pioneers with Disabilities on June 14, 2012 at 7:00 PM at the Church Office Building Main Floor Auditorium. The Department of Counseling Psychology and Special Education at Brigham Young University is hiring for a faculty position, moderate to severe disabilities. If you are interested in the position you can download the job description here. If you now anyone else who might be interested, please help share the news. Kyle Woodruff has worked with Janice Kapp Perry and Joy Saunders Lundberg to organize a musical fireside based on the album Far Different Places. 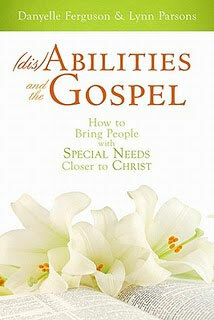 Danyelle Ferguson and Lynn Parsons released a book this summer titled (dis)Abilities and the Gospel: How to Bring People with Special Needs Closer to Christ. I have wanted to make a big announcement with a detailed review ever since, but since that has not happened yet, I at least wanted to make sure that people are aware and will point you to some other book reviews. "Brady has hundreds of seizures everyday, yet strengthens his community." "Well, as we sat and discuss this for nearly an hour, Bishop Noble said (and I'm paraphrasing), "I think we should ordain Ethan. Not just for him, but for the ward. I think it would be a great thing for the ward to be able to see him passing the sacrament and experience him. In fact, I hope he does have a meltdown while passing the sacrament..."
"I hope he does have a meltdown while passing the sacrament." Calling all Ward or Stake Disability Specialists! "The bishopric or stake presidency may call a ward or stake disability specialist to help individuals and families." Read more about Calling all Ward or Stake Disability Specialists! With Him We'll Stand is a beautiful book by Ray Johnson about his two brothers Stuart and Nathanael who were born nearly 16 weeks premature. 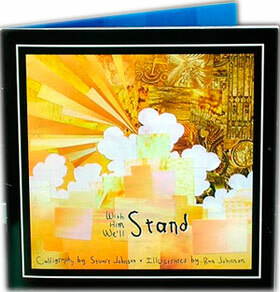 The story includes beautiful paper collage illustrations as a backdrop to the words of the hymn, I Believe in Christ. In this article titled Serving Family Members Who Have Disabilities from Meridian Magazine, Daryl Hoole highlights three families and their experience having a child with a disability.